Along with sacred Scripture, Tradition transmits the Revelation of God that was given to the Church by Jesus Christ. Both of these together flow from “the same divine well-spring” (DV 9). Sacred Tradition may be understood in different ways. In a general sense, Tradition is an overarching term to describe all of Christ’s Revelation, both spoken and written, which was entrusted to the Church (cf. 1 Tim. 6:20). Saint Paul has this meaning in mind when he commands the Thessalonians, “So then, brethren, stand firm and hold to the traditions which you were taught by us, either by word of mouth or by letter” (2 Thess. 2:15). This “letter” (probably 1 Thessalonians) has divine authority because it was authored by both Saint Paul and the Holy Spirit. This Tradition is itself part of God’s Revelation for His Church. Hence, when the New Testament explicitly condemns different traditions (cf. Mt. 15:1–6; Col. 2:8), it is only denouncing those that are merely human in their origin. The Tradition that the apostles committed to the early Churches comes from Christ and the Holy Spirit (cf. 1 Cor. 11:2; 2 Thess. 3:6) and thus is authoritative as Christian teaching. After all, Christ commissioned the apostles to preach the Good News (Mt. 28:18–20; Mk. 16:15). The spread of Christianity in the world was accomplished primarily through the living and oral transmission of the Word of God by the apostles and their appointed successors. The more specific meaning of Tradition, however, consists of the teachings that God Himself delivered to the apostles but were not completely recorded in inspired Scripture. The fullness of the Christian faith cannot be contained in a book, even an inspired one. 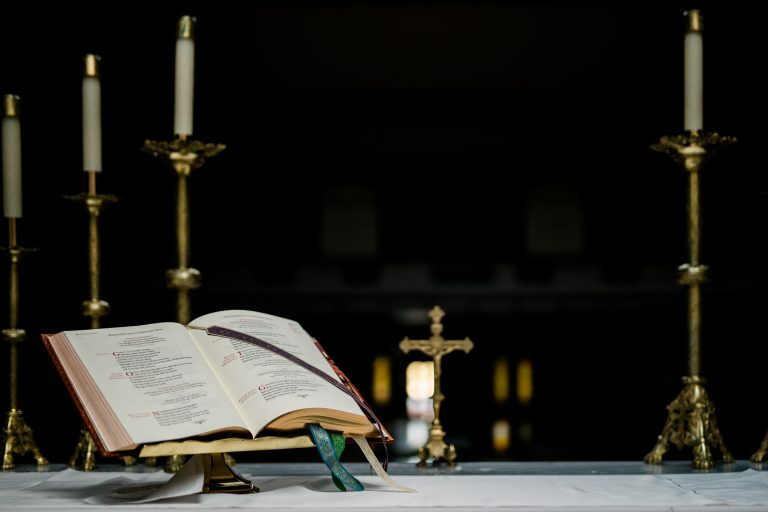 The ecclesial or “Church” offices of pope, bishop, and priest, the rubrics and celebration of the liturgy, and the seven Christian sacraments are essential elements of the faith. These cannot be confined to a book even though they are part of the Church’s life in every age. Indeed, the Church was alive and flourishing before any word of the New Testament had been written (cf. Acts 2:42). In some instances, the writers of the New Testament even preferred to instruct the young communities in person rather than by writing to them (cf. 1 Cor. 11:34; 2 Jn. 12). This is not to undervalue or marginalize the written Word of God; it is only to distinguish it from the fullness of Christianity which encompasses it. Sacred Tradition is so vast and yet, ironically, many Catholics wonder where to look for it. One might think it more convenient to put it all in a single volume, so that we could place it beside the Holy Bible on our coffee tables. But this is to misunderstand Tradition. When the Church speaks of Tradition, she is referring to her faith found in the creeds and canons of the Church councils, the teachings of the popes, the writings of the early Church Fathers, the teachings of the saints and doctors, and especially the celebration of the liturgy. There are places besides the Bible where the Christian Gospel—God’s Revelation—is preserved. This Tradition mediates to us the riches of Christianity, not only in the form of beliefs, but also in the life and worship of the Church. The new and everlasting covenant is made present here and now in the Church. This will help us to see that Tradition is not a collection of secret beliefs whispered from ear to ear down through Church history. The councils, the creeds, the liturgical rites, and the writings of the Church’s greatest Fathers and saints all bear witness to the Church’s treasury we call Tradition. The faith that the apostles handed on to the early Church is the same faith we hold today. Tradition does not add to what was given before the death of the last apostle, whether handed down orally or in writing. However, our ongoing reflection on God’s Revelation can yield a fuller understanding of our faith as the centuries pass. As the Church gradually mines the treasures given her in the first century, she is called to make explicit what Christian believers have always held implicitly. Directed by the Holy Spirit, she is entrusted with God’s Revelation and is thereby called to unpack all the many implications that the truth has upon our lives. The content of Tradition does not grow throughout history, but the Church’s understanding of it does expand and mature. The Church always holds to the ancient faith of the apostles, while developing her doctrines more clearly and applying that faith to meet the needs of Christians in every age. Dr. Curtis Mitch holds an advanced degree in Theology and Christian Ministry and, along with Dr. Scott Hahn, is the annotator of the Ignatius Catholic Study Bible. He is also a contributor to the Catholic for a Reason series, including the article “Divine Revelation” in Scripture and the Mystery of The Family of God.